The union representing 86 public health nurses in Windsor-Essex believe the health unit was “intentionally underspending” on salaries. The Ontario Nurses Association (ONA) says the Windsor-Essex County Health Unit returned hundreds of thousands of dollars in provincial funding to the government in 2018. “Documents posted on the health unit’s website show that $537,776 of the funding returned was due to the board of health not filling vacant nurse positions, filling some positions with lower-cost workers and intentionally underspending on salary and benefits last year,” says Vicki McKenna, the president of ONA. “While the health unit CEO says an equitable wage increase for the dedicated nurses who provide the vast array of programs and services to Windsor and County of Essex residents is ‘unaffordable,’ the health unit underspent 3.42 per cent of its salary and benefits expenses,” claims McKenna. 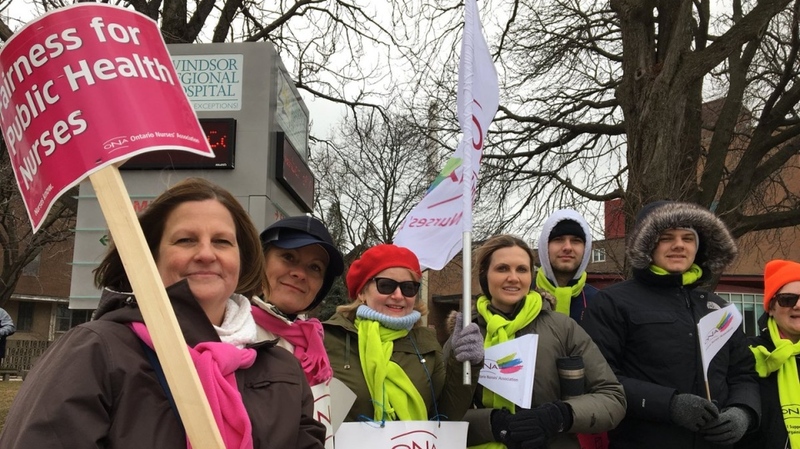 The 86 nurse practioners, registered practical nurses and public health nurses went on strike March 8 to demand more money after rejecting the agency’s final contract offer. They have been working without a contract since March 31, 2018. Theresa Marentette, the CEO and the Chief Nursing Officer at the health unit, tells CTV Windsor the funding that was returned to the province was offered to the union as a signing bonus, but had to be accepted before the end of the fiscal year in December. “Part of our agreement, the three per cent over three years, there was an offer on the table for a signing bonus as well,” says Marentette. But she says the union was not interesting in a signing bonus. “The offer that was on the table is a fair and reasonable offer, it included wage increases, increases to benefits and no concessions for our staff,” says Marentette. The health unit offices in Windsor, Leamington, and Essex remain open Monday to Friday from 8:30 a.m. until 4:30 p.m. But residents have been warned to expect service delays and a number of programs are cancelled, including the healthy schools program as well as breastfeeding, sexual health and family planning clinics. The ONA is urging the health unit to call the nurses back to the bargaining table.